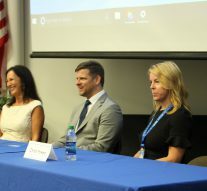 On April 8, a panel to discuss the importance of strong communication skills was held at the Tarpon Springs Campus. Professor Ned Johnson organized and moderated the event, which was attended by many students, as well as several members of SPC staff and faculty. Panelists included Dr. Christy Powers, Dr. Chris Blaine, and Maura Sweeney. Those with access to SPC Workplace can watch the panel here.